The Southern kitchen is all about hospitality and positive vibes, not to mention delicious food and great company. You feel a lot of love in a Southern kitchen, maybe that's why I adore them so. From top left: cake stand, mason jar with fresh tea, Good Day print, tea cup, vintage table linens, pitcher and tea towels. Wendy and Ward Binns live in this wonderful craftsman bungalow right in the heart of Atlanta. 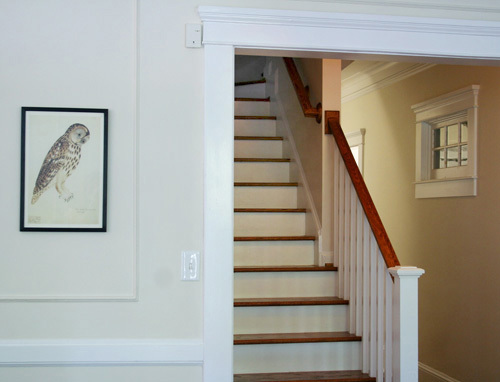 Wendy is the owner and publisher of the Atlanta INtown paper and her home, built in 1920, is a mix of formal and traditional, with an ode to mother nature. 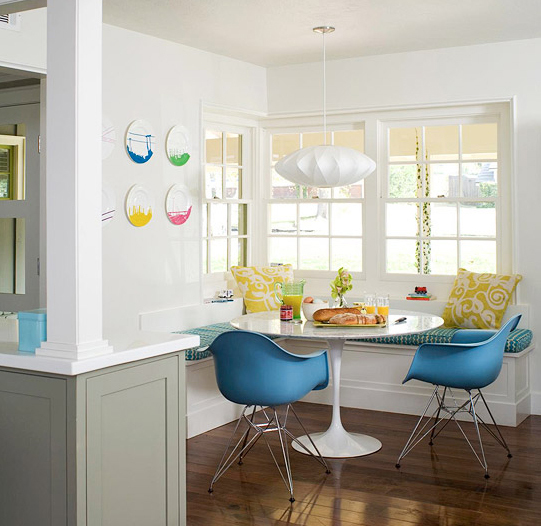 The dining room is one of the first rooms you see when you enter Wendy's home. 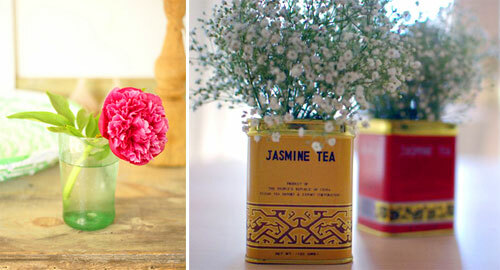 She has wonderful bunches of greenery found from room to room. Her friend Duane Marcus helped her plant the right foliage and flowering plants in her garden to best complement her style. A job well done as this added touch fills the bright, inviting space with warmth and beckons you to come sit and hang out a while. The dining table is from Urban Cottage Atlanta and the chandelier from Pottery Barn. 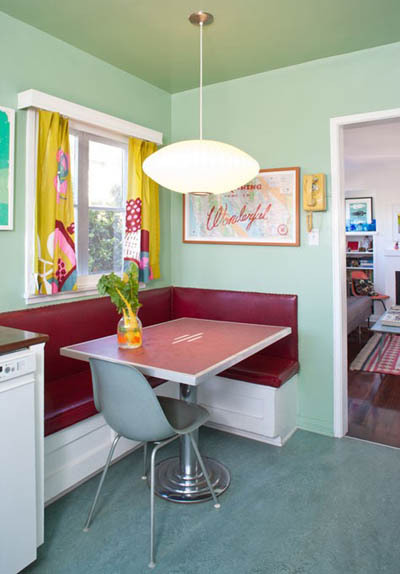 Her lovely kitchen nook is everything a nook should be. 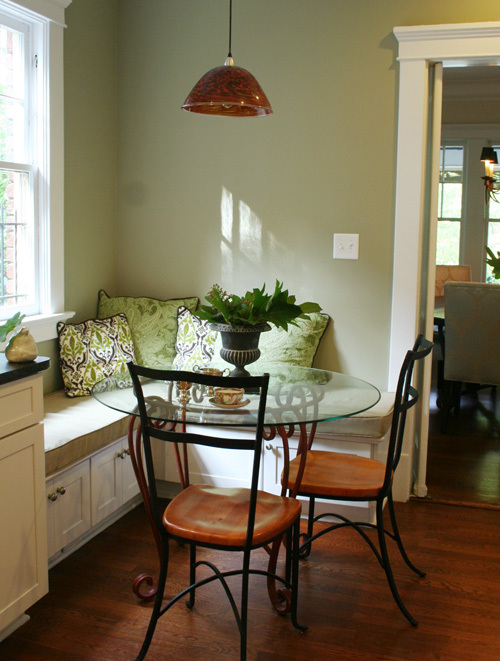 It's inviting and charming as she mixes greens, browns and whites in a perfectly sized corner. A teacup is always a good cozy indicator as well as plentiful pillows. I also adore Wendy's collection of silver vases that have been handed down by her mom and grandma. Wendy added clippings of artemisia powis castle from the garden this morning. So lovely and unusual. Wendy has the sweetest bathrooms. They're simple and white with just a pop of color here and there. 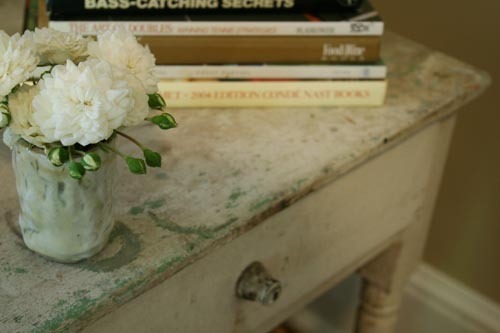 I'm a fan of anything distressed so when I saw this great green and white side table with the pretty green and white flowers, I had to take a moment to capture its imperfect perfection. As many would agree in the South, the porch is the favored room in the house. Such is the case for Ward and Wendy who spend a ton of time relaxing on theirs....along with their cat, Larry whom Wendy describes as "wanting to be everyone's best friend." Larry was certainly a most gracious host. Lovely home Wendy and Ward! And an exciting aside...Wendy is featuring a few Sweet Peach blog entries each month in the Atlanta INtown Paper. Wendy is calling them Peach Picks and September is the first featured month so please take a look if you live down this way...or check it out online.